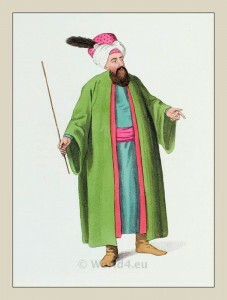 The Chief Usher to the Turkish Sultan. Ottoman Empire. Home » The Chief Usher to the Turkish Sultan. Ottoman Empire. The Chief Usher to the Grand Seignior. The Chief Usher to the Grand Seignior (former sultan of Turkey). In Plate XXXVI. we have described the nature of the numerous body of Ushers in the court of the Grand Seignior (Sultan); we here give a representation of their commander, or chief; an office of great power and importance, at least on some occasions. One of their employments, among others, is to present every one who is introduced at court, or approaches the fool of the throne; and, on some particular occasions, this is done by the chief usher himself. 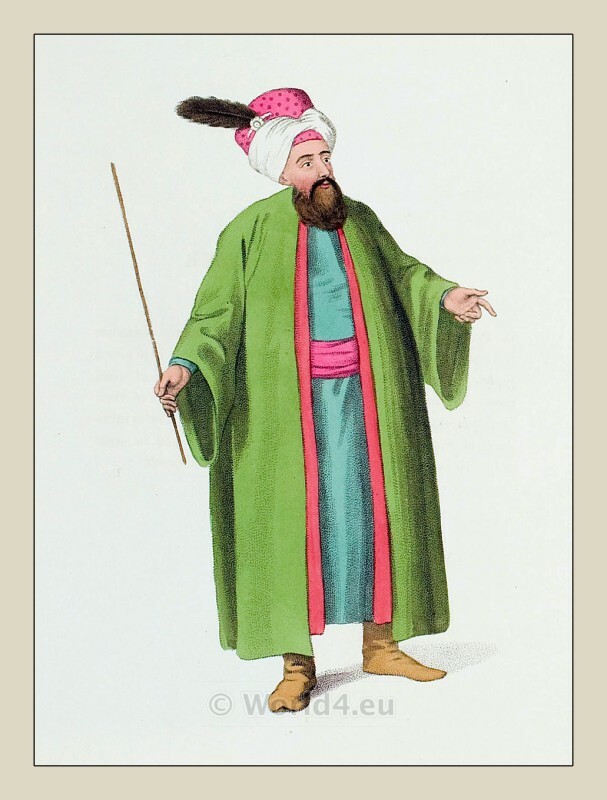 This entry was posted in 1804, 19th Century, Military, Ottoman Empire, Turkey Costumes and tagged Octavian Dalvimart, Ottoman Empire costumes, The costume of Turkey, Turkish Military Costume on 6/10/13 by world4.